Scientific consensus on climate change anticipates marked increases in extremes in Europe, particularly in heatwaves, droughts and heavy precipitation events. At the same time, UK government approaches to the management of increasing extreme weather risk have shifted since the mid-1990s from a top-down centrally imposed model to devolved responsibility where Civil Society is a key player. One definition of ‘Civil Society’ is: ‘a public space between the state, the market and the ordinary household, in which people can debate and tackle action’. 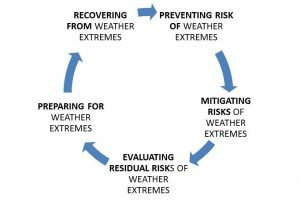 This could include any voluntary collective activity in which people combine to achieve change on a particular issue – here extreme weather adaptation. Changes in the responsibilities of Civil Society in extreme weather adaptation are also being played out in other international settings – with strong potential for learning across localities, regions and nations. This seminar series aims to examine critically the changing role of Civil Society in Extreme Weather Adaptation Cycle. The CASCADE.NET series comprises nine seminars – interdisciplinary, transdisciplinary and inter-professional – with strong representation from Civil Society and non-academic organisations (NGOs, community groups, local government), both nationally and internationally. These seminars will navigate and negotiate challenges and opportunities for research and practice in how Civil Society prepares for extreme weather risk, and recovers from actual events in ways that increase resilience. The seminar series discussions will capitalise on dialogue between new configurations of UK and international participants (academics from different disciplines, Civil Society representatives, businesses in the community, risk management agencies). Partners include National Flood Forum (England and Wales), Scottish Flood Forum, and Climate Outreach. Case-study settings include UK 2007 floods, 2013/2014 floods Somerset levels; Hurricane Sandy in New York/New Jersey; Vanuatu, Maldives, and Bangladesh but will be added to as the series progresses. The series is organised into three themes, with nine seminars in total. Click here to see the full seminar programme. Theme 1 (T1): Civil Society: new citizenship, social networks and ’emerging publics’: The role of the State in society is changing, requiring new relationships between the State and individuals (citizenship), and Civil Society to be defined. Understanding these is critical if we are to manage risk from extreme weather and work together towards building greater resilience. The seminar series starts by examining different shifts that have taken place in role of Civil Society in the UK and internationally (Europe, US, Australia), and development of new understandings of ‘participation’ and ‘citizenship’. Theme 2 (T2): Reframing social spaces in extreme weather adaptation and governance: The seminar series will offer opportunities to discuss changing associations within and with Civil Society – from primary vertical interactions between citizens and the State, to increasingly horizontal interactions between the third sector, informal groups and networks, public sector, private sector and government agencies played out at local level. The expansion of the range of actors actively involved within Extreme Weather Adaptation has necessitated a level of convergence between institutions, groups, and networks that formerly operated separately from each other, thereby creating new social spaces. In defining such new social spaces, voices of the marginalised and disenfranchised must be heard. These include groups by demographics, ethnicity, disability, and more vulnerable sectors of society. Theme 3 (T3): Achieving Civil Society innovations in managing extreme weather events and risk: In many parts of the world, local Civil Society has responded to extreme weather event impacts creatively- either through using technology in new ways or through social and artistic innovation (e.g. Hurricane Digital Memory Bank;). This part of the series explores learning from collective experiences of these innovations and their implications for the functioning, capital and empowerment of Civil Society within Extreme Weather Adaptation. The working seminar titles are provided in the Table below. The seminars will be co-hosted with Civil Society organisations and other players, situated in different UK locations, and be available virtually to maximise national and international engagement to draw together different perspectives and approaches that exist in research, practice and social learning for increased resilience. Diverse outputs from the seminar series will be co-produced and tailored to different audiences, with attention to their sustainability and legacy. These include: a dedicated website, a set of position papers, academic-practitioner journal articles, use of social media (an online discussion forum, twitter feed), newspaper articles and a participatory toolkit.